Will O365 only support subscription based licensing starting from 2020? In 2017 Microsoft announced that as of 13 October 2020 only versions of Microsoft Office for Windows desktop (Win32/64) that are still in the mainstream phase (first 5 years) of their support life cycle will be able to connect to Microsoft Office 365 online services like Exchange, SharePoint and OneDrive. Does this mean that Office 365 will only support subscription based licensing? In short, no - customers will be able to continue to use perpetual licenses for products that are still in the mainstream support lifecycle (first 5 years). But this announcement will affect organizations that have used perpetual rights to Office 2010/2013. Some organizations obtained perpetual rights in prior licensing agreements and use them when they move to Exchange Online to save money by not subscribing to a more expensive Office 365 SKU that includes the full Office suite. They planned to run releases they owned until support ended. But Microsoft's announcement will significantly limit that possibility starting 13 October 2020, when the ability for all currently available versions of Office for Windows desktop to access Office 365 online services will end, and organizations will have to license Office 365 ProPlus or versions of traditional Office less than five years old. While not on Microsoft's public lists of reasons for the change, it's difficult not to notice that the new policy is also a way for Microsoft to pressure organizations to move off perpetually licensed products, requiring them to pay annual subscription fees. Most organizations that move to Exchange Online and other Office 365 online services license E3 for most of their users; but, to save money, many profile users and license E1 for those that have perpetual rights to recent Office releases. 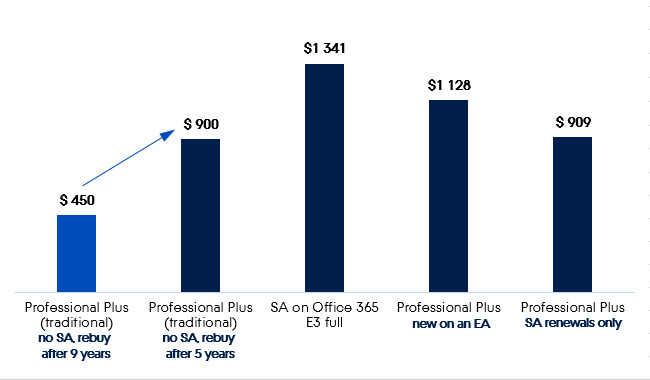 Organizations currently using Exchange Online or SharePoint Online with traditional editions of Outlook and other Office components should budget to subscribe to Office 365 ProPlus (or a bundle that includes it, e.g., Office 365 Enterprise E3) by October 2020 or rebuy traditional licenses every five years or less. Analyze Office usage to determine if Outlook on the web (previously known as Outlook Web Access and Outlook Web App) and Office Online could be suitable replacements for the Office for Windows desktop experience. Pilot carefully to verify your analysis before deciding. Reassess your move to Microsoft's Office 365 email and collaboration services if your users can't use the browser versions, or if you can't afford or justify purchasing an annual subscription for Office 365 ProPlus or repurchasing Office at least every five years. Re-evaluate your situation and renegotiate with Microsoft if you recently decided to drop SA on Office and take a "vacation" prior to subscribing to Office 365 ProPlus or Office 365 Enterprise E3 and lost your "From SA" discount and want to reinstate your discount.